Would you like some cheese with your wine? Yes, please! Cheese is delicious on its own, but fondue brings together three of the world’s greatest things—cheese, wine, and the camaraderie of a shared meal. Homer’s Iliad describes a mixture of wine, goat cheese and flour enjoyed in ancient Greece. In medieval times, vineyard workers in France are said to have dunked meat into boiling pots of oil. Nevertheless, most people credit the Swiss with refining the art of fondue. 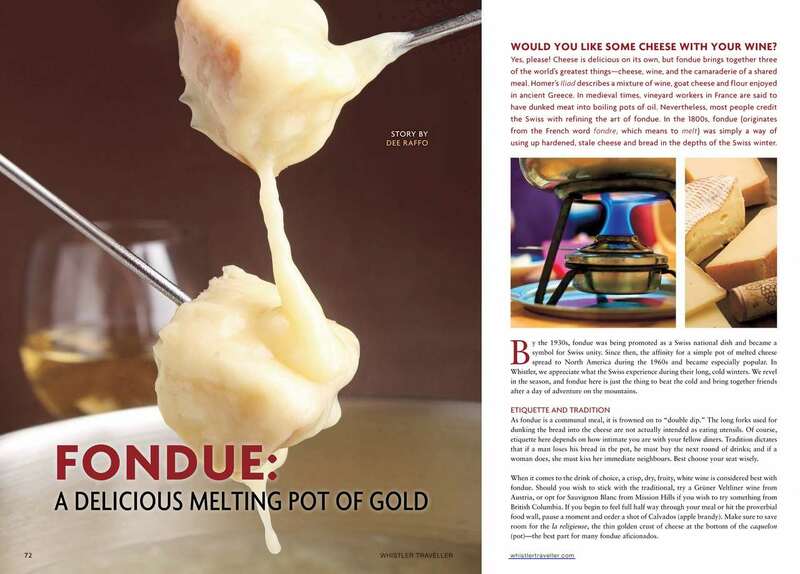 In the 1800s, fondue (originates from the French word fondre, which means to melt) was simply a way of using up hardened, stale cheese and bread in the depths of the Swiss winter. This entry was posted in Whistler and tagged fondue, Whistler. Bookmark the permalink.